I have been eager to make almond butter for sometime now. I looked in the cupboard and found I had exactly one cup of almonds- so I finally decided to take the plunge. Looking at the almonds I thought this is either going to turn out great or be an epic fail. Soak your almonds for 6 hours and dehydrate them until they are completely dry. This step is optional, but recommended. Once they are soaked and dry, place all the ingredients in a food processor and blend. It will take about 10 minutes or more depending on your food processor before it actually turns into a butter. At first it will look like a fine flour and all of a sudden the oils from the almonds come out and you will have the most delicious nut butter. Now that I had my almond butter that surprisingly turned out great, I wondered what to pair it with. Growing up, I loved the peanut butter and chocolate combo. I would scoop out a spoonful of peanut butter and throw some chocolate chips in my mouth. Who am I kicking- I still do that on occasion now. I could only imagine how nice my almond butter and some fresh raw chocolate would taste together. So, this is how the lazy raw almond cup was born. 8-10 dates, chopped or 1/2 cup of raw honey, agave or maple syrup. Wash and take the pits put of the dates. Chop up the dates-this will make blending them with the water easier. Place the dates in a food processor and add all the water. Blend until a nice paste is formed and put aside. You will need to melt the coconut butter/oil. To keep it raw, either melt it in your dehydrator or in a bowl immersed in warm water. Once the coconut butter/oil is melted, incorporate the cacao powder and date paste. I found that one cup of cacao made this recipe very rich so feel free to add less, and if you have a big sweet tooth, a little more sweetener wouldn’t hurt. 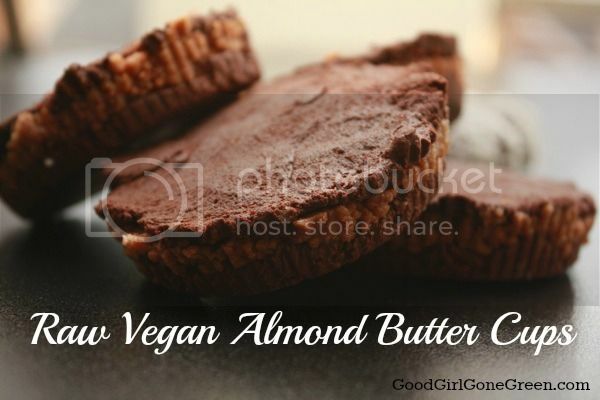 Now that you have the almond butter and chocolate, there are few options: eat the almond butter and/or chocolate by the spoonful, or make the lazy almond butter cup or the not so lazy almond butter tart. For the lazy almond cup, simply take the almond butter and chocolate and mix it all up in a bowl. Scoop out the mixture and roll it into balls. Take each ball and roll them in some finely chopped coconut flakes. Place them in the freezer until they are ready to be served. The second option, is to actually make some almond cups. Take a small paper tart, place a scoop or two of the chocolate and press down. Do the same with the almond butter and the outer layer of chocolate. You are layering the chocolate, almond butter and again chocolate. Put the tarts in the freezer for 1/2 hours to an hour. Take out of the freezer right before serving. My recipe made 4 tarts and 4 lazy balls. I actually preferred the lazy almond cup, well because they were easier to make and I like to always take the easy route. I did not find the almond butter and chocolate mixed together, too rich nor too sweet. The perfect combo. Just so you all know- they tasted spectacular! Which will you be- a lazy cup or a not so lazy tart? These were awesome! I have to say though, next time I’ll double the recipe because there weren’t enough almonds in my food processor to make the butter! I had to keep stopping it and scraping. Those look AMAZING and delicious! Found you via the Stumble Hop! Yummy find! They so are and so simple! It is really simple to make and the lazy way tastes super yummy! Thanks! It is very yummy! Oh God that looks good! There must be something in the water… I made almond cookies today! So good, Sarah! Let me know if yo try it! Well since its part lazy can i use almond butter instead? The tarts look yummy! I will have to try these. If you do try them- let me know! WOuld love your feedback! 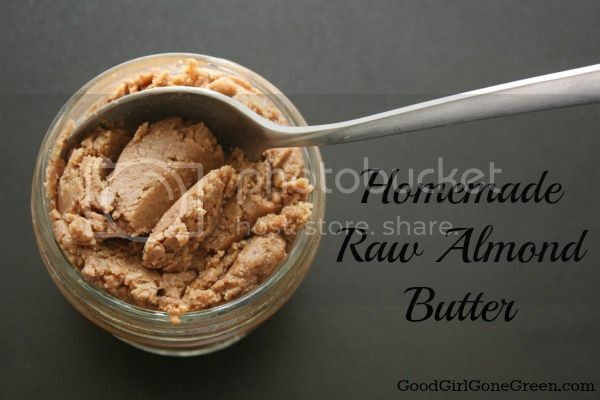 I have to try this Almond Butter Recipe. Thanks so much! You do! It is so delicious! Thank you! Will see you tomorrow! This is brilliant! I will have to try this! I pinned it! Thanks for linking up to Pinterest Monday! Hope to see you again next week! These look awesome! We have tried to make almond butter in the past but always ended up adding in oil because it didn’t seem like there was enough liquid to really make a creamy nut butter. Maybe we just didn’t wait long enough. I am definitely going to try making these (the lazy way). I never thought it would turn into a nut butter but it did! It is not creamy like peanut butter or anything, but it does the trick. LOL! They really are tasty! I would maybe pout less chocolate- they were a bit rich. Let me know if you try them. These look yummy! I’m going to bookmark the page so I can try them! I have been making energy balls lately, but I’ve never tried to make an almond butter before. It is so simple and delicious. Thanks so much for sharing your recipes at Rural Thursdays! I am sure walnut butter would be very good. Any nut or seed can basically be made into a butter! Almond butter is so tasty. Let me know if you make some! They are! If you make them please let me know!